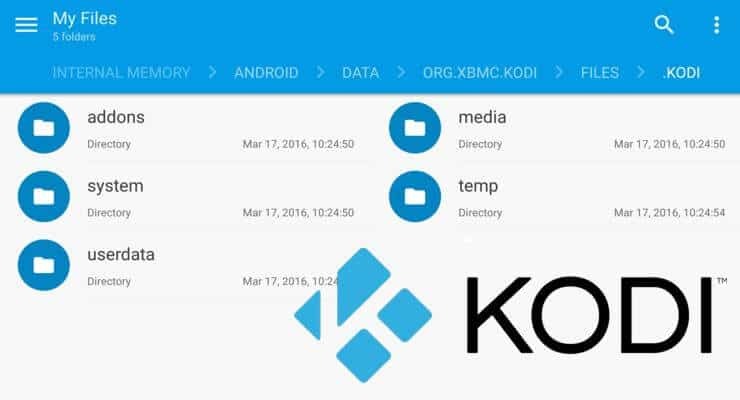 Knowing Kodi folder location can come in very handy for setup and maintenance of your HTPC or Kodi box. For performing manual operations such as duplicating Kodi settings to another device or optimizing Kodi performance by editing advancedsettings.xml requires you to understand Kodi folder structure. In our previous Kodi beginners guides, we have described what is Kodi, Kodi usage, adding media sources, and changing skins. In this firth part of Kodi basic guide, I will present Kodi folder location on various devices and operating systems as well as understand Kodi folder structure. This guide provides just enough information so that you you are not lost when it comes to troubleshooting and maintenance. On some platforms, the Kodi folder is hidden so you will have to enable viewing hidden files on your file explorer. You will have to have opened the Kodi app at least once for the Kodi data folder to be created. The list below describes how to find Kodi folder location on several common platforms. Notice the dot in front of kodi. This indicates that the folder is hidden. So if you are in “files” folder and don't find anything, enable viewing hidden files and folders. So there you go, Kodi folder location in all common devices and operating systems. To delete Kodi settings and rebuild from scratch just find and delete the Kodi data folder (Warning: Understand what you are doing before doing this). Once again, notice the dot in front of kodi, indicating it is hidden. If you are accessing through Samba then enable viewing hidden files in file explorer. addons – This is the Kodi addon directory. So any addon you install will be downloaded here. If an addon causes problems and stops Kodi from starting, you can manually delete it from this folder. media – A place for media files. But this is typically empty and not used. Add media sources instead. sounds – For customizing sounds. Typically empty and not used. system – For system customization. Typically empty and not used. temp – For storing temporary files such cookies, weather information, subtitles, etc. This folder may also contains Kodi logs (or one folder up). When troubleshooting make sure to check the log files located here. addon_data – All your addon data are stored here. If you want to manually reset an addon then delete its folder located here. Database – All databases (Music, Videos, EPG, thumbnails, addon databases, etc.) are stored here. If you have a Kodi MySQL library setup then your video and music libraries won't be stored here. Keymaps – Stores all your custom keyboard and remote mappings to customize your Kodi remote control. mediasources.xml – This XML file stores any remote folder locations (eg. NFS, SAMBA, FTP, etc) that you manually add to your Kodi. profiles.xml – In case you have multiple Kodi users with different profiles, their information will be stored in this file. sources.xml – In Kodi you add your video and music locations. Once added they are stored in this file. advancedsettings.xml – One of the most important files to control and tweak Kodi. guisettings.xml – All your skin settings are stored here. passwords.xml – Stores any usernames and passwords to media sources listed in mediasources.xml. playlists – All playlists are stored in this folder. You may manually edit if you know how. RssFeed.xml – This file contains all RSS feeds from which the scrolling news in Kodi homescreen is scraped. Thumbnails – Thumbnails folder contains cached thumbnails of all images (posters, fanart, etc.) that appear on your screen (not limited to Library items). This folder can grow several folds in size over time and may need periodic cleaning. So there you have it. You do not need to know Kodi folder location or Kodi folder structure by-heart. Just keep this as a reference and come back to it whenever you have a need to work on any of the files and folders in Kodi app data folder.